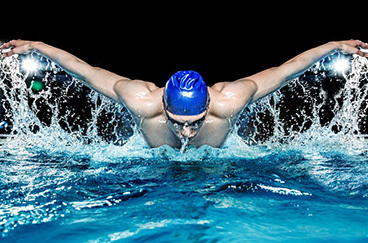 We offer specialized triathlete swim training for athletes who wish to gain a competitive edge. In our multiple-day, 40-minute private adult swimming lesson format, you’ll improve your strokes in as little as 5 lessons, but a minimum of 8 are recommended for optimal results. Often times, swimming is the weakest link for those training for a triathlon, and triathletes underestimate how challenging the swimming portion of a triathlon can be. You may be strong and athletic, and yet swimming can still come as a challenge because it’s about learning the appropriate swimming techniques that will help you thrive during your race. Our private swimming lessons are optimal for learning advanced swim techniques faster than group lessons because the student receives 1-on-1 specialized instruction that is tailored to their skill level and ability. In our accelerated program, lessons are taught over several consecutive days instead of once or twice a week. Each day the student improves dramatically! If you’re looking for a competitive advantage and want to invest in your triathlon success, we’re the right school for you!